UI offered first-generation college student the support and opportunities needed to help her achieve her goal of international travel. Leticia Garcia always wanted to travel the world. A first-generation American and daughter of Mexican immigrants, it was sometimes hard for Garcia to see a global path from her home in Glenns Ferry, Idaho. At the University of Idaho, Garcia found the resources and opportunity to make that dream a reality. As a student in the College of Letters, Arts and Social Sciences (CLASS), Garcia studied overseas in Argentina and participated in a summer trip in Africa. Now, she’s planning a future working in the nonprofit sector. Garcia graduates in December with bachelor’s degrees in international studies, Spanish and Latin American studies. Her international journey began when a representative from UI’s College Assistance Migrant Program (CAMP) visited Garcia’s high school in Glenns Ferry in southern Idaho. As a first-generation college student, Garcia said she was unfamiliar with how to navigate the college application process, but CAMP offered the support she needed, including the scholarships that made it possible for her to attend school. Coming to UI was the first time she’d ever left her home and family. Garcia had multiple interests and struggled to select a primary area of study, until she met with Ro Afatchao, associate director of the International Studies Program in CLASS. He convinced her to try one class. In addition to studying Spanish, she was also interested in examining Latin American culture in UI’s Department of Modern Languages & Culture. 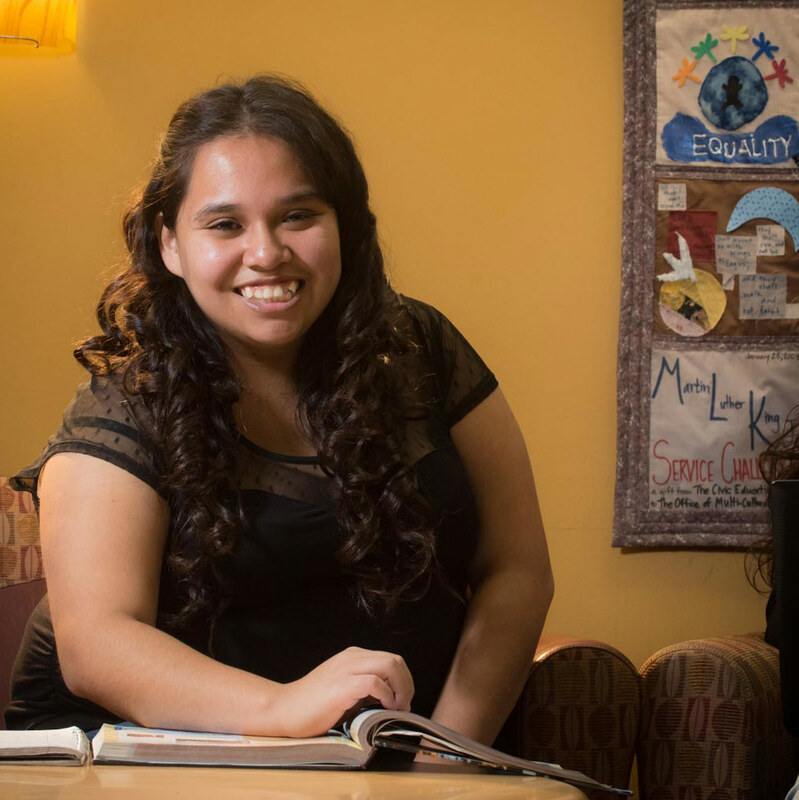 Through ambitious study and hard work, Garcia was able to complete all three majors and only add a semester to her study. Director of International Studies and the Martin Institute Bill Smith said it’s a testament to Garcia’s dedication. He said she’s been a joy to have in the program. In addition to her schoolwork, Garcia is involved in multiple groups on campus, serving in leadership roles in a variety of organizations. She is a sister of Gamma Alpha Omega Sorority, Incorporated; member of Sabor de la Raza (Mexican folkloric dance group); volunteered as a conversation partner and international mentor through the International Programs Office; participated in Oxfam, Movimento Activista Social, CAMPOS student organization; recruitment events at St. Augustine’s Catholic Church; and in UI’s Organizacion de Estudiantes de Latino Americanos. The depth and breadth of her volunteerism at UI shows Garcia’s dedication to serving her community, something she was able to continue doing while traveling abroad. Garcia studied abroad for a semester in Buenos Aires, Argentina, in spring 2015. While there, she was able to continue her volunteerism and service abroad. For summer 2016, Garcia went on a Martin Institute-sponsored trip to Togo, Africa, with Club des Mis Amies. The group worked to spread awareness about children’s rights and helping children in trouble. After graduating, Garcia hopes to continue pursuing her dream of traveling the world and working for a non-governmental organization that is involved in human rights, families and children, “something where I can get myself involved and be able to work with people and help them through problems they’re currently in,” she said. Her dedication to helping others extends to her family: She helped her younger sister, Griselda, who is studying exercise science and health in UI’s College of Education, navigate the college system. “Our parents are really encouraging: They want us to get a better education. They had to drop out to work and help their families. They always pushed us to get an education,” Garcia said. For her part, Garcia is glad she got hers at UI. “It’s been the best experience I could have hoped for. I never imagined getting this far in my life, but I’m so glad that I came to the University of Idaho,” she said.